In our continuing pursuit of the joy of the written word, we have embarked upon creating our own homeschool library. The actual collection of books was started in my father’s childhood, continued in my own and has been vastly added to through the childhoods of our own eight children. Prior to building the actual bookshelves we found that we had piles of books in every room, every corner, and on every surface. We all knew where our favorites were so location was not a problem. Literally every corner of our lives was happily consumed by books. Ultimately it was time for a bookcase. Well, actually a library. So with this in mind we have been building a “school house” and “library.” It has taken us over a year but we have finally done it! Athena immediately dedicated herself to the Herculean task of unpacking the books (our close friends that we had not seen for a year!) and organizing them by subject and alphabetically by author. This monumental activity took her 12 hours a day for more than a week. She chose categories: fiction, biography, travel, history, science, foreign language, religion, philosophy, poetry, reference, etc. Within the categories she alphabetized each book by author. I was very nervous with all this organization. I am used to playing a mental game of Clue with my books, “I last saw this volume in the kitchen, under the table, with the candlestick.” I honestly wasn’t sure if I could find the book I wanted by searching for it on the shelf. Athena ignored my concerns and powered on. Everyone in our family has worked hard to make our school house dream a reality and with everyone’s help we now have a fully functioning library and schoolroom with 1000’s of the greatest books a child could dream of; we have beautifully illustrated classics, enticing modern dramas, wonderful history and science books filled with paintings and maps and internet links. Now for a great home education: all we have to do is sit back, choose a great book and read, read, read. 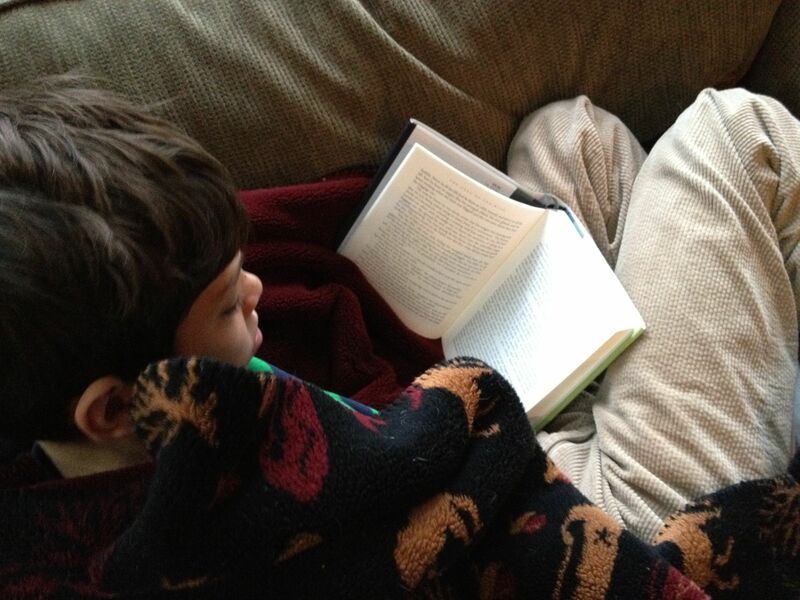 Let Me Count the Days: Homeschooling is learning to read and reading to learn. Oh, my goodness, I LOVE your library. It makes ours pale in comparison. Wonderful work! I now have something to aspire to! I love your homeschool library! It looks so well thought-out and inviting. The painted tables and chairs are perfect. My children would love to work in your library. Congratulations! We have been waiting for this for years. We can’t believe it ourselves! We had the most fun putting the books away because everyone had to keep grabbing their favorite books to re-read them. Ah wow, your library is incredible. I’m so jealous! You must have a massive house! It is not the house but the book collection that is massive. We are book lovers as I am sure you are too! Long live the written word. Breaking the 10th commandment here. Oh cool – just saw that a homeschooler made Freshly Pressed! Congrats! Thanks so much! We are thrilled. It is exciting to be able to present a positive view of homeschooling to the larger community. I’m speechless. That is amazing — and what a great, affirming task for Athena to personally organize the shelves. Indeed the best part of our new library is the way Athena has embraced it as her personal responsibility. Having the children take ownership of the library is the first step towards them taking ownership of the importance of reading and of their own education. Long live the printed word! What a fabulous library! I was once a homeschooled kid whose mother put a lot of thought and effort into building a great library for us at home. I’ve reaped the benefits many times over and will try to do the same for my own kids. Good for you!! I love the way you remember your mother “putting thought and effort” into building you a library. She gave you an invaluable gift. I am sure you will share the blessings with your own children. i like the library soooo much !! 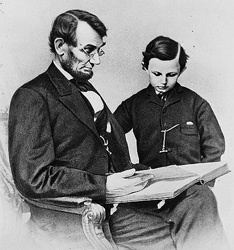 Abe Lincoln really knew the value of reading. We should all follow his example. Happy collecting! what a great idea and worthy pursuit. congrats! Thanks so much. Books are our passion. My dream! Kids today need to be encouraged to read books, actual , ink-smell-wafting-into-your-nose books. And making picking up a book in itself an adventure as you’ve all done here really supports that. Good work! You are so right, kids do need to learn to love books. They do regard their new library as an adventure, especially since they were so involved with its creation. They love to climb up on the ladder and slide around and select a new favorite. Reading is water for the mind. My books have been in boxes for years; I can’t wait until our library is done (we’re in the process of remodeling). Thanks for the inspiration! You will have so much fun unpacking! Just remember to organize as you build your library, it really is worth the extra effort. Have fun! Haha I’ve been slowly expanding my own small collection of Fantasy and non-fiction. Our family is homeschooled as well and I must say, out side of everyone else’s personal books, we have hundreds of others. And they are everywhere! I think it’s high time that we do something like this! I was a bit skeptical at first, but organizing all the books in one place and under one system has made it easier for all of us to enjoy all the books. Also, it works better from the homeschooling perspective. Lovely post, and absolutely wonderful library – I would LOVE to have book shelves like that filled with all those books! Thanks for sharing and congrats on being freshly pressed! Thank you so much for your kindness and support. We are having so much fun with our new library. You are right, the high ceiling is not only airy but also a great excuse for having bookshelves that reach to the stars! My family was homeschooled as well, but our “library” has only consisted of one skinny shelf and books scattered throughout our rooms. However, I learned to love books so much I’ve started writing them! The gift of reading is spread through the scattering of books. The shelves are nice but what counts is the joy of literacy. We love homeschooling too. You’re library looks great! I was homeschooled by my mother until 4th grade and I honestly believe that my love of books and reading is the best gift my parents ever gave to me. Books have such a magical quality. The library from Beauty and the Beast has been my dream since childhood and looking at your photos shows me that someday I will have to build my own! You are correct. The gift of truly loving to read is the best gift one can share with a child, and lasts a lifetime. You are so luck to know the magic of reading. I look forward to seeing your library one day. I love your library. I wish I had the room to build bookcases like yours. I’d love to see pictures of your schoolhouse. Thanks for your support. I am sure the schoolhouse will make an appearance soon. That is a very nice library. And eight kids? I hope you’re not homeschooling because you’re fundamentalist Christians. But even if you are, I applaud you for providing a vast range of reading material for your kids. And think of this, everything is increasingly going digital, including books. I’ve noted that in my collection it ceased some time ago and is now resident on my laptop and my phone. Do you find that digital reading is comparable to reading a book? We have several electronic reading devices but we all keep returning to the actual book. It is more fun to hold, easier to review and becomes a better friend. I find it a little more difficult for highlighting and annotating but I note the Kindle application is improving in that respect. What I do love about the e-readers is that they are small enough that I can take my library with me wherever I go. Oh I am in love! I would never leave that room. Great job! Thanks! We may never leave ourselves! This reminds me of my family. We still have scads of books left over from homeschool and college, including most of mom and dad’s college texts from decades ago! Books are the best. They remind you of where you have been and lead you to your future. I love your library, Allia. Love it, love it, absolutely love it. Thank you also for the beautiful post. Thank you so much for your encouraging words. Books are the best, aren’t they? LOVE your growing library and just one of many great things about home education! I have thought, “If my children read even a portion of these books they will be thoroughly educated.” More importantly, if they learn to love reading they will be able to continue their education throughout their lives. It is wonderful to be able to read while being surrounded by even more books, waiting to be read. Your library is beautiful. Your children are blessed. Thank you for reminding me of that wonderful quote. To Kill a Mockingbird is one of my favorite books. Thanks for reblogging. I look forward to visiting your blog. Indeed we are lucky to have so many favorite books. Thanks so much for your support! It is great to meet so many generous souls. I home-schooled for years and had bookshelves but this is a dream come true! BEAUTIFUL! Thank you! Both homeschooling AND having bookshelves are a dream come true. I love being able to share my favorite books with my children. I’m drooling over your library. All those lovely, lovely books lined along the seemingly endless shelves! Makes my pulse race just thinking about what sort of knowledge I’d discover. My home is also much like yours, sans library/bookshelves; there are books everywhere. However, I’m working toward remedying that as the additional 18 moving boxes filled with books is starting to get to me and the adventure of discovering which box a particular book is in has quickly worn off. When we were unpacking the boxes it was like Christmas. Each box contained wonderful, unknown surprises. And once the boxes were opened they always contained books that we loved! Good luck with your 18 boxes! 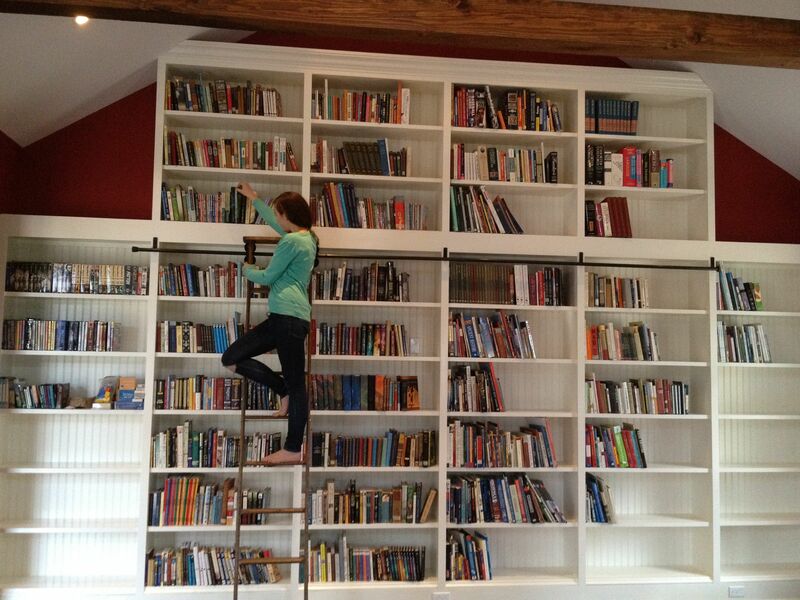 I love this….ive always dreamed of having my own library-with a sliding ladder! Im growing my collection every week…hopefully one day it will look as amazing as yours! The books are the best part but the ladder is a close second! Everyone loves climbing for their favorite book! This library is incredible. As a book lover and believer in textual education, this library seems like a dream come true. I can only hope my future home bears something similar to your bookcase. If you love books you can count on having a library in your future. It will be worth the wait, and it certainly is a dream come true! It is my dream to organize all my books. We have SOOOOOO many. Right now I have some of them organized alphabetically, some by subject. But right now we have our collection spread out over seven different rooms! It is a but ridiculous. Congrats on your new library, and thanks for the inspiration. These booklists would be appropriate for young adults or mature teenagers (although some of the books on the India list deal with mature subjects). Again, thanks for the ideas! I will be following your blog. Thank you so much for including this information. We would love to have some themed booklists. Unit studies are definitely the best way to study social studies and history. I will certainly be checking out your lists and your blog. Thanks! You sound exactly like us. I was very nervous watching Athena categorizing and alphabetizing but she was 100% correct. The books are better with a system. Now we all really enjoy searching among the shelves. Simply fantastic. I love your library. Wow!!! I’m a big fan of reading. I can’t get enough of books. I’ll read anything, even the dictionary. Guess that’s why I’m a writer. Love your idea. It came out beautiful. We love the dictionary too, and also all reference books, and of course fiction, fiction, fiction. Keep reading and writing! That is insane. You have so many books. I love it. We have so much fun choosing what to read and which subject to choose. Books are just so much fun. Do you think you can adopt me? Please?? I would never leave the house if i had a library like that! Believe me, we don’t want to leave either! With a book you can travel the world without ever leaving the library! Happy reading. How neat! I love libraries; they say so much about the people who own them. Organizing all those books is a job I would enjoy. I was surprised by how happy Athena was surrounded by boxes and bags of books, day after day. Now she is very proud. Wow! That is amazing and really fun looking! It really is fun. Thank you. Books as you say, are our friends. Long live the printed word. A downloaded book cannot be a friend in the same way. My husband and have many books and we have collections back to my grandfather. And we keep adding to the number. My favorite books also belonged to my grandfather. I love to handle them (gently) and to think of all the times they were read, handled and enjoyed. Digital just doesn’t do it. Our bookshelves are an absolute mess, books stuffed in at all angles, we need an Athena to sort them out! A budding Librarian perhaps? Our bookshelves also used to have all the books sideways and piled up in all directions. It really is easier this way, despite my initial reservations. I love that new word: Bibliovana. Do you mind if I start using it? Athena had so much fun organizing the books, and reacquainting herself with so many favorites at the same time! This is wonderful! I will be homeschooling if I ever have children and this library is inspirational. I have a few overflowing book cases myself and am fond of collecting books from my childhood. I got the pleasure of working in my college library for two years. Athena did a great job categorizing and alphabetizing, very professional! I always loved organizing and shelving for the library, especially in subjects that interested me. (I got to take a peek from time to time) 😀 I followed your blog as well and love your background image! Thank you so much for your very supportive comments. It is nice to know that there are so many people who truly love books, reading and learning. Isn’t it great to have books from your childhood? They contain so many memories. Homeschooling is a great way to share the things that really matter to you with the people (your kids) who also matter the most. Have fun on the reading adventure. For me bookshelves, not the kitchen, are the heart of the home. At the very least they are a close tie. Definitely a close tie. We put some bookshelves in the kitchen too for exactly that reason. What a wonderful library ~ it is gorgeous! Happy reading! Thanks! We love reading together as a family. Do you? Beautiful. What I like most is you still have plenty of room for new acquisitions! Books are my best friends too, and getting children to fall in love with reading is so important. Some day soon you too will have your own cozy reading nook. Wow, simply amazing! I would love to have something similar in my own place! Congratulations on your awesome library and on getting Freshly Pressed! Thanks so much! The library is so much fun and actually homeschooling can be great fun also! This is one of the most fantastic things I have ever seen. I have a multitude of books lying around, and reading this made me look around and notice that I had books in every space of my apartment. Awesome job on your home school library. Bravo. As you can tell from this post, we have had books in every corner for years. Having them accessible is a true joy. homeschooling is not great – but the library is outstanding. Homeschooling can be outstanding too, you can’t discount the natural joy found in reading and learning. Thank you! The kids a really enjoying reading, which was the goal! Thank you so much for your positive comment! I am so glad to find so many people who love books. Beautiful library! So happy to have found another homeschool blog! I rarely see one on Freshly Pressed. Thank you. Homeschooling is almost as much fun as building a library! The shelves are simple yet splendid! Thank you. We are so pleased to finally be able to find see all our books at once. Love the library. Because I love books too! Books are the best, aren’t they? I love books and have been attempting to create a home library of my own. But I have to keep packing it up to use the room for other purposes. Someday tho…. Don’t worry. Soon you too will get all the books on the shelves! That is a great idea and the bookshelf looks nice. I have library envy!! It is possible to have kids that love books as much as games! Books last longer too! I love when kids love books. We have a board game shelf in our library too! I enjoy giving our 9 – soon to be 11 – grandchildren books. Reading together is a pleasure that continues from one generation to the next. I remember my grandfather reading to me and using “funny voices” and that is something I continue as a legacy to pass on. Remember to write a note in the books you give, including the date and occasion. I have several classics from my childhood and I love to see that I was given and read The Swiss Family Robinson at age 8. My children enjoy seeing these notes as well. I love it! That is really impressive, and I wish my tiny 1-bedroom apartment could fit all of my books like that! Is it bad that I could tell some of the series from the first picture? I used to have tons of books piled up in a one bedroom apartment too. Looks like you have a future librarian in your house. Definitely. Athena is a true bookworm. Now we have the “re-shelve” area awaiting her action. Don’t you love reading in bed? It is the best way to begin and end everyday. Thanks for reblogging. I look forward to visiting your blog. Thanks for reblogging! I look forward to visiting your blog. A home library, no matter what the size, is truly so much fun. Books to the ceiling. One of the joys of homeschooling. The children keep their favorite books at the top just so they can climb! Thanks for reblogging. I look forward to visiting your blog. Homeschooling is filled with unexpected joys. Thanks for reblogging! I look forward to visiting your blog. Those are a lot of books! Keep reading and keep up the good work. Speaking of books. My second book is going to be published very soon–maybe in February. The title is “The First Time I Rode a Freight Train & other hitchhiking stories”. My first book was “High Plains Drifter: A Hitchhiking Journey Across America” (Amazon.com). Thanks for including the titles of your two books. I will look for them. Good luck and keep writing! As a former English teacher, I’m thrilled that you love reading! Athena did a fabulous job! I am not sure you can be a “former” English teacher. Loving English and reading and writing is a life-time state of mind. We have been much happier since we have become better organized. We now have a separate area for art, that helps with the organization. Oh, don’t think I want that kind of organization! Heaven forbid! I LIKE my library the way it is! Organized disorganization! :D To each his own!!!! I totally understand! I was very nervous as my daughter embarked upon her massive book sorting scheme as I am quite accustomed to choosing my books from among piles residing all over the house. Now that the deed is done I can say that we are all enjoying the order. Before, only I knew where everything was, now everyone can find their favorite books. I guess it takes a sharing mentality to really appreciate the organization. A library is a great place to begin a thoughtful collection of books which explain God’s work in our world. I am sure your legacy will be appreciated! I love your library. Have you done any online homeschool? wow the library of my dreams! fabulous sliding ladder and all! The ladder is everyone’s favorite. They like to keep their favorite books at the very top just so they can climb up to get them. I can’t wait to set up in a country just to be able to have a huge library. Being able to read by the fire is the best part of country living. Mmmh, I meant in A country (I’m French, live in the US, plan on moving again) but now that you talk about a nice fire I can easily picture myself in THE country! Yes, I thought you were French but you are right, The country is quite nice also. omg ur library is awsome! Thanks! The kids are having so much fun with it! I wish I had one too. It’s heaven for any book lover. Books are a small daily dose of heaven. Cool project. It gives me hope that printed books won’t go the way of the dodo bird. That was a funny but appropriate comment. It seems that there are yet many bibliophiles and that the printed word will yet be with us for some time. My husband and I have thought of doing that exact thing. I want to live in a library! Now hopefully you and your husband will be inspired! Living in a library is a great idea! found your blog from fresh pressed, and i love your library. I’m so jealous!!! We are loving it too and are so grateful to our daughter for committing herself to organizing everything! Organizing our books has given us all great pleasure. Now it is so much fun to read and choose various books. We have friends who ask to “borrow” books so it is becoming a community library as well as a family library. Very nicely done! I always felt that when things are organized it increases an individual’s motivation. So in this case, organizing your books into a nifty library-like setting will essentially motivate your family to want to skim through the collection and pick up a piece to read! My family did something similar with our DVD collection which we have close to 800 DVDs (Yes I know its not a very intellectual comparison to books, but it will get the point across!). It was difficult to find a particular movie so we numbered each video and made a catalog of the movies with the title, actor, and rating. When you find a movie you like you look at the assigned number and find it on our shelves. I think from then on, we were more motivated to find older movies in our collection rather than just the recent ones we purchased. You are right. The children have been much more motivated to really think about which book they want to choose. They are looking at everything, not just reading the most recent thing they can think of. I look forward to visiting your blog. I cannot even begin to express how envious I am about the library. If there is one thing that is driving me nuts living in New York City, it is the inability to have giant stacks of books organized neatly for my convenience. You are literally living my dream, passing books down like that… my big fear in life is that electronic media will prevent me from ever realizing my dream of having a library for my children to enjoy. Great post, and thanks for sharing. I know just what you mean. I spent many years living in NYC and books weren’t the only thing stacked vertically (dishes!Clothes!) Don’t let the electronic media get you down. A beautifully illustrated and bound book is priceless. When you have the space you will build the library. Children seem to prefer “real” books to digital. When I finish university and get my own place, I am going to get me one of these. Even if I have to eat bread and cheese for a year to pay for it. Bread and cheese will make very good reading companions. A library is a dream come true. I love reading and it’s fantastic that reading isn’t dying in this modern age of psp’s and got knows what. We are working hard to preserve the joy of reading. It definitely takes a conscientious effort. If at all possible might you email me a list of your categories? If you have the time I would be very happy to have it. Certainly. The categories we used are: fiction, biography, autobiography and memoir, science, art and music, US history, world history, foreign language, philosophy and economics, religion, sports, preschool and young children. I hope this helps. I look forward to seeing your online lessons when you create them. What a great idea and a great blog post. Thanks so much for your support. It is so wonderful to see how many people truly love books and reading. I think one of the keys to good writing is having a strong voice. So true. A book is only as good as the author. As bloggers we are all searching for our voice. I’m incredibly jealous of your library! I hope to have something like that one day! You too will have your own home library. Just keep reading and collecting! Thank you for reblogging. I look forward to visiting The Little Things to Share. This is amazing! I grew up in a homeschool family with a love for the local library and our house had mini book stacks ALL over the place! I’ve been seeing a lot of great library pictures lately; have you every checked out the rare books and manuscript library at Yale? Most impressive one I’ve seen yet! Yes! We love the rare books library at Yale. Last year we took a tour of the library and were able to read some original manuscripts from the 1700’s. We also got to see the Guttenberg Bible on display. 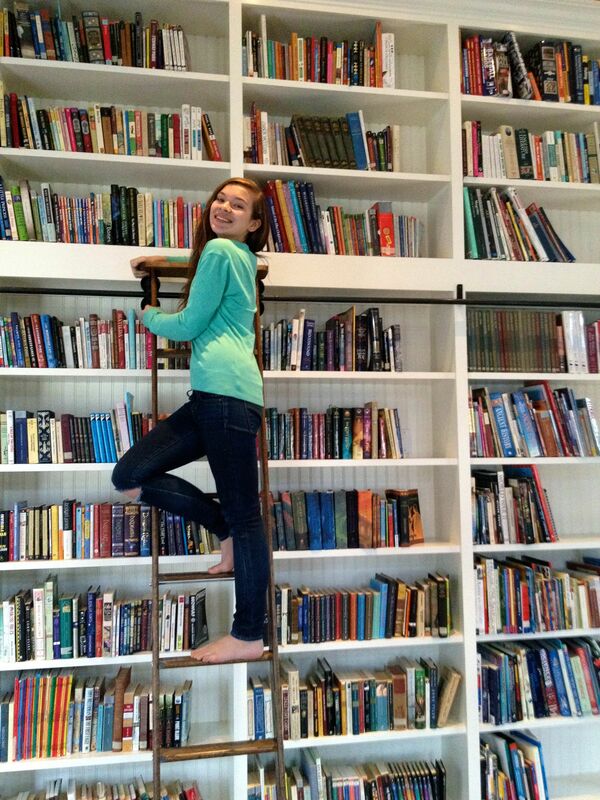 I think many homeschoolers are growing up with books stacked in every room. It is a beautiful thing. Keep reading! Did Abraham Lincoln really say “I ain’t”? LOL. Wow that library is awesome!It’s too easy to rent a film now I need to start reading more often! A book can be much more interesting than a film. The details are more specific and you can create the imagery in your own mind. Absolutely amazing. I used to dislike books when I was a kid but now I absolutely love them. I wish one day I will have a library as big and rich as yours! Books tell wonderful stories and inspire us with facts and fiction. If you love books you will always have a friend. What an amazing library and an awesome idea! I just recently put up some new bookshelves to accommodate all my books, but it pales in comparison. And that sliding ladder…amazing. Before our library we were constantly putting up new bookshelves but we just couldn’t keep up. The ladder was absolutely the best touch. Congrats on your new amazing library. Very inspiring post for me, another homeschooling mom. Homeschooling and books, two of my greatest joys. Nice! I have my own bookshelf too… it’s quite small but I love it. This inspired me to make it bigger. We started with just one small bookshelf too…books grow like wild fires if you really love them. GORGEOUS library! I’m so jealous! Wish more people would read instead of watching “reality” tv. Formulate their own thoughts instead of being told what to think, or rather, not to think. Exactly. By doing our own reading we can think our own thoughts. What can be better than that? What a GORGEOUS library! I am so totally jealous! I look forward to checking out your blog. You sound like a real book lover. Athena really put her mind to this task, I would have become distracted along the way. Hope you have a library soon! Nice post! I also love books very much ever since I was in grade school. However during this time, I can no longer read the books I like because of hectic schedules that I have. ButI always see to it that I won’t miss reading anything in one day, so what I do is to download and read ebooks form my phone so when I’m traveling, I’ll still be able to read something. I’m proud to be a book lover! As long as you are reading and enjoying it then that is what counts. My eyes would hurt from reading on a phone! Loved the library! I want to have one too! Unfortunately, none of my friends is a reader. Sigh! Then you should inspire them to become readers. Give great books as gifts. This is lovely! I can only aspire to have one like it one day. Thank you. I am sure you will have your own space that you create that reflects your dreams and interests. Yes, the music room must be next. Congrats on being pressed….keep reading! Thanks so much. As a result of this post I have met so many people who really value the written word. Thank you so much! I can always use the support! My dream library. Reading is one of those things that is neglected far too much. Thanks so much for reblogging. I look forward to visiting your blog. You are right, let us hope our society doesn’t neglect reading or we will all be illiterate. Your library looks amazing! Congratulations! Thank you so much. We have had a lot of fun arranging, organizing and finally reading! This is honestly my dream. I hope to have a big enough space one day to display all the books I’ve been collecting and treasuring over the years. Thanks for the inspiration. A greatly treasured book collection is the most important first step. I am sure you will realize your dream one day soon. Hey guys I’m a writer and i’M NOT GOING TO BE ANNOYING AND ASK YOU TO READ MY WORK, BUT I WOULD LOVE IT IF YOU ALL CAN CHECK MY WEBSITE AS AN AUTHOR AT http://www.celindasantillan.yolasite.com/ tHANK YOU!! Thanks for your support. I look forward to checking out your blog. Reading is the best! What a wonderful thing. We’re an equally bookish family and love that books are just part of the fabric of our lives. We have multiple bookcases and piles of books around our home, which work quite well, but I envy your beautiful newly arranged library. Your daughter’s efforts are truly amazing – I wouldn’t have had the patience to do what she achieved. Well done! We have spent years with every room flooded with books. We are really enjoying the new organization, but some books are still creeping out to take their places by beds and couches. What a collection! Your library is beautiful and I love the ladder (very “Beauty and the Beast”-esque!). I always pick up books and then put them down after a few chapters (if at all). This has inspired me to have another go at it! Try finding a book you absolutely love. It is difficult to finish a book that doesn’t interest you, but once you find the right book it is impossible to put down! LOVE IT, omg. I have always wanted a giant wall of bookcases in my house (Beauty and the Beast, anyone?) and you’re the first normal person I’ve seen who has done it!! Kudos, and I am trying this when my boyfriend and I finally buy a house. Several people have mentioned Beauty and the Beast. I guess I am going to have to re-watch that movie. Thank you for your assumption that I am normal! I am sure you will have a great library too. Also, you call it Clue, but we call it Cluedo. Is that just a version thing, or is it a significantly different game? Clue is the mystery game where you try to solve Who did What Where. Is that the same as Cluedo? Books make wonderful memories, and those memories belong solely to the reader. It is very hard to give them away. 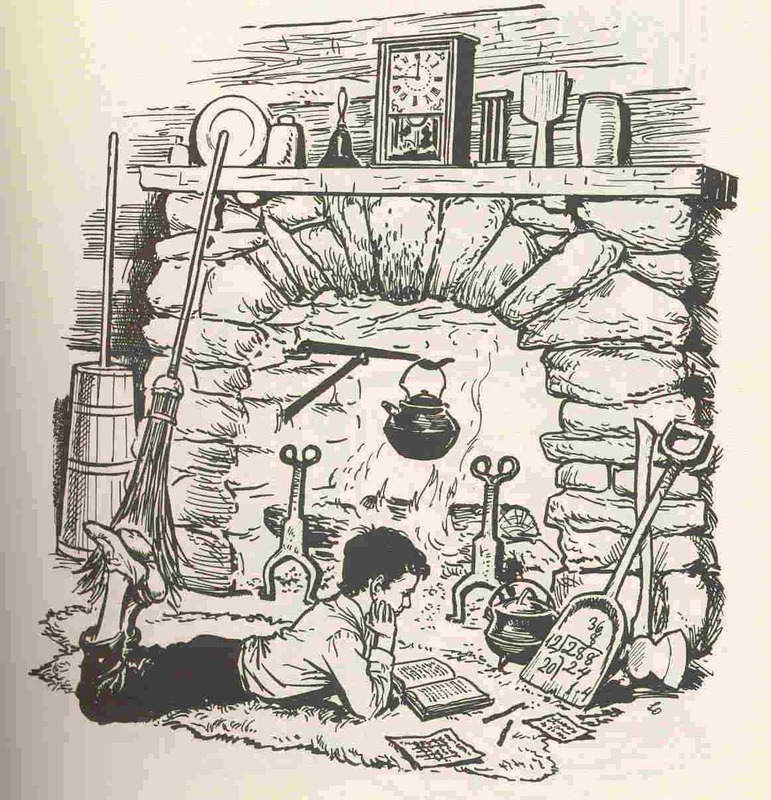 WOW that looks like our house, lol… I love love LOVE books. If you read my about me page, you will read what everyone we know has to say about all our books, lol. I should get one of those tablet reading devices, but in reality, there’s nothing better then holding, smelling and even taking in the actual book. I do envy the big library as mine is a bit smaller, but commend y’all for building it for your kids and using it as a teaching tool! I look forward to reading your about page. Books make the best friends, and they are even better when shared with friends and family members. Have fun reading! Love this! Will be reading more of your blog for new ideas! Thanks for posting & congrats on the FP! I am inspired! Still contending with the notion of homeschooling again. I keep getting these timely posts, and now this one. Perhaps God is speaking to me?! Thank you, and congrats on being Freshly Pressed! Homeschooling is a huge responsibility but at the same time it brings tremendous joy. Make the decision that is right for you, since you are the one that will be responsible. You will know what is right through thought and prayer. Wow, I’m seriously jealous – your daughter is living my dream – she’s even got the ladder I’ve always wanted! We do not provide many alternatives to reading. Literacy flourishes in an environment filled with books but sparse on other distractions. Reading is a true joy and it is our responsibility to see that children can experience this joy early in life. Wow. Am I envious of those bookcases!! What a wonderful idea – such a gift for your family. And I just love the fact that you have the children’s books of different generations available for your kids. The books belonging to my father and grandfather are some of our favorites. They have particularly beautiful illustrations and remind us that bookbinding is an art not easily replaced with the digital product. Reading is a gift that can easily be shared by multiple generations. I love to read and dream of having my own library in my home. Your library with a moving ladder is so inspiring. Thank you! The library is great and the ladder certainly makes it even more fun to search for our favorite books. Thanks for your support! I AGREEE WITH YOU TOTALLY. Thank so much. I look forward to visiting your blog. I love your library. It’s so awesome. Also, I love the name Athena. I would do the same thing she did, organizing the books by category and alphabetical order. I love to read and have books all over my room. Hopefully, one day, I’ll be able to have a place to live where there’s enough space to have a whole room dedicated to books. Isn’t it great having books all over the room? I love to be able to turn in any direction and find something fascinating to read. Someday you too will have a whole room dedicated to books, in the meantime enjoy the book chaos, it too has its merits! very nice post. It looks so beautiful and well-organized library. Thank you. It is amazing to finally have all our books in one place where we all can enjoy them. I must admit that I am slightly jealous of that gorgeous bookshelf! But I’ll get over it. Congratulations on building that, that is something you and your family can cherish for years. No need to be jealous. We waited years for this library. I am sure you too will have the chance to create a wonderful reflection of your tastes and interests. That is an amazing library! I want one that grand one day. Mine is taking over my office. I don’t have enough wall space for shelving units so I just have to deal until lover and I can buy a larger home. We too have had stacks of books and shelves in every room. That can be fun too, searching for your book can help you discover other ones you may have forgotten. Exploring stacks of books is a great way to spend the afternoon. Home schooling is good and libraries are good reading is good literacy is good. New Here come visit. Literacy is a gift we should encourage the world to enjoy. Oh, I love it! We aren’t a home-schooling family but we are a book-loving family and a book case with a ladder looks like a slice of heaven. Congratulations on your school house and new library. Being a book-loving family is the most important thing. Your family can go anywhere they choose once they master the art and love of reading. Oh My God! Now I want to read in a library like that, what more will the children! It’s very exciting! You are right. It is great to have a space which inspires both reading and a love of books. Your library is fantastic. And how wonderful that it is organized. But the best part was seeing a young child curled up with a book. Congrats on being freshly pressed. Thank you so much. And you are right, better than any library is to see a child falling in love with a book. My husband and I are both book lovers and moved into our first house together after we got married last year. We’re living in the parsonage of the church where we’re on staff and have four bedrooms all to ourselves! You can bet one room is a library AND it was the first room completed when we moved in. Yours is beautiful! Love the shelves. You built those? I homeschooled as a kid and have considered on more than one occasion homeschooling my own one day. What fun it is to have a never-ending supply of books in one’s own home. Beautiful! I grew up surrounded by books. My parents built bookshelves and used them as room dividers. The bookshelves could be used on both sides so no matter which side of the room you were in there were floor to ceiling books. Homeschooling is a great way to share family values – like reading! Oh. Wow! I have library lust for your schoolroom bookshelf wall. That looks so beautiful and amazing. I have always wanted a wall of bookcases rising to the ceiling, filled with all my constantly multiplying volumes. Your photos go in my inspiration file. I am honored to be in your inspiration file. You too will have floor to ceiling bookshelves, when the time is right. Until then, keep reading and collecting! I adore your home-school library! We just set up our library, too. Of course, ours is quite a bit smaller, but we love it. We started it 8 years ago when we started home-schooling. I bet you are so happy with your new library. Homeschooling and reading go perfectly together. The kindle is great too, but it doesn’t replace all books. I bet you still love the books of your childhood. Really a good article on reading !!!!! Children should be encouraged to read good books which will enrich their vocabulary and make them well verse with great authors like Mark Twain, Louisa May Alcott, Jack London and Alexandre Dumas. You are absolutely correct. It is not just about reading, it is about reading quality literature and excellent resources. We can all grow by learning from the great minds of the past. They do love the ladder! They also love thinking about in which category to place a book. The place for a book is in their hands! Such a wonderful thing you’ve created there for your family, I would love to be able to do that, but we lack the room. My wife has said we need to start buying ebooks instead of novels because our bookshelves are full! Ebooks are good for transitory reading – books you don’t intend to reread or savor. My experience is children prefer real books that they can touch and hold and turn the pages and look at the pictures. One way to make room for new books is to eliminate books that aren’t really that special. We donate ours to the local library book sale. You are lucky your library is so generous. Ours is too but somehow I still end up owing fines! My favorite library tool is a laundry basket, that way all the books are in one place and they are easy to read, fined and return. I am sure your child will love this story, especially as you are reading it aloud. That always makes a story more enjoyable. books – real physical books are oh so beautiful!!! thank goodness there are people who think the same. I have heard from hundreds of people who still love real books. There are actually so many of out there, it is like a secret society. Thank you. We are having so much fun exploring all the different genres. Illustrated books are our favorites. Wow. This is inspiring to a homeschooled bookworm like me. I can’t afford one now, but a library like this is one of the things I want to pass down to my kids. You can gather your books gradually, as we did. We found many great books at our library booksale, some for only $! or $2. At the end of the sale we were allowed to take home whole boxes for $5. I am a librarian at heart and I am awestruck by the dedication to reading in a home situation. You may have seen this video already “Joy of Books.” I loaded it on my website. I also just posted a review of The City of Ember and the People of Sparks, which might be ones found in your collection. We too are librarians at heart. I look forward to visiting your website and seeing “Joy of Books” which I have not seen. We do have The City of Ember but not The People of Sparks. I look forward to reading your review of these two books. I am so glad to find so many fellow book lovers. The library is fun and having the children design and organize it is even better. Now they are committed to the preservation of books and the appreciation of reading. I too have lost many books over the years. The best ones come back and the others perhaps weren’t so important. Have fun rereading and rebuilding! Beautiful! One day I hope to have enough books to be able to make my own library. Book collections are built gradually but with thought and love. Enjoy the process. Wow, it is so amazing ! It is one of my dream to have a library as in the Beauty and the Beast. Yours look splendid! I hope to have my own one day and that my kids will appreciate to read books made of paper. Books made of paper are the best, especially when they include beautiful tales, well written and illustrated. Who can resist? What a wonderful library and the encouragement it brings the children is simply fabulous. GREAT WORK!! Yes, the best part is giving children the gift of loving literature. Your library is absolutely BEAUTIFUL!!! Thank you so much! I appreciate your support. And I still fantasize about owning such a library at home someday. Seeing that I’m still 18 and hot blooded, I hope to make that true one day, filled with all my favourite books! You have lots of fun ahead of you before you start building your library…meanwhile enjoy all your favorite books. I am so glad you had fun reading about our library adventures. For us it is a dream come true. Beautiful library. It is wonderful to be surrounded by books. The digital stuff is great to but there is nothing like a room full of books. Indeed. It is still fun to turn real pages and to peak into different books. Digital is great for traveling but it is fun to have real books at home. Excellent library! This is one of my top priorities when I get my own place. Love it! I am thrilled to meet so many people who want to build their own libraries! Literacy yet lives! I have been lucky enough to have inherited more than a thousand books, most of them many decades old and with beautifully decorated, golden covers. The perfume of them still strikes me as magical to this day. On the topic of paper versus digital, I must say that we should embrace the new technology and do our best not to destroy trees needlessly, while at the same time preserving the paper books that already exist for their aesthetic value. You are so lucky to have inherited all those wonderful books! I agree the smell of old books is intoxicating. Digital books are nice but they do not create the same sense of commitment, not withstanding the need to preserve trees of course. I LOVE BOOKS SO MUCH !!! Yeah!! We do too! Books open our minds to so many new thoughts and possibilities. Wow! And I was so proud of my library. I need to build my collection so that I can have a ladder one day, too. The ladder is definitely the icing on the cake. It is certainly a motivation to keep collecting…have fun with your reading. I look forward to visiting Literary Distractions. Those are the coolest bookshelves I’ve ever seen! 1000s of books….. that’s totally awesome!!!!!!!! 1000’s of our favorites! We are having so much fun reexploring all our old favorites and share new favorites with our friends and family! Very impressive! And an amazing thing to do for you and your family. Thank you. The kids were totally behind this project, which made it a lot more fun. I’d kill for book shelves like that! We are having a blast with them! That’s the library most people on dream of having. I am truly jealous… And, in a word, impressed. I skimmed your biography and find myself in awe of your approach. I suffered through public education, and have spent my first three years re-educating myself, and the effort continues today. The 12 years I spent in public schools were worthless. Senseless projects that did nothing but waste time, wasting time books that are not even considered classical canon and writing “essays” on those books that didn’t go past 2 pages. I’ve been playing catch up ever since graduation. I loathe the entire idea of the educational system (even in college, many of my classes and projects are essentially worthless). Also, I want your library. I’m building my own slowly but surely. I happened upon 20 harvard classics and 41 various books from another hardback collection for 10 dollars at an estate sale, which certainly helped (of course, I haven’t read nearly enough of them. Most of them are the complete works of certain authors; however, having them has created a great reference library for an English major like myself). I have also nearly filled a second bookshelf of books I’ve actually read, and am about to start on a third. My children WILL be home schooled, and I vow to have an all inclusive library from which to teach them. My first three years of college, I mean. Thank you so much for your endorsement of my efforts. I really appreciate that you understand my disappointments with the traditional school system. We are doing a great disservice to today’s children my allowing them to be undereducated while giving them the impression that they have “graduated” from school. It is fabulous that you were able to buy an excellent book collection for only 10 dollars! We have bought many of our books from secondhand shops and library book sales. This is a great way to procure a classic collection. Enjoy the books, the reading and most importantly, your interest and knowledge of English literature. I know you are a Book Booster–I hope you will sign your name to the list. These days we (by which I mean the woman I live with 😉 ) prefer to keep the walls of our house clean and uncluttered, with occasional paintings and African tribal masks, but I remember a time when I would build my own shelves and cover every inch of wall space with books. Ah, wasn’t that a time! I envy you! Book collections are wonderful, cluttered and otherwise, but I am sure you have your priorities in the right place. You can borrow and return your books from the library but your relationship is their for you to keep. Enjoy! I hope to get such one of mine own!!! You will I am sure! That is amazing. I’m jealous! The kids really like it the best because now they can find all their favorite books! This is really wonderful! As a school librarian, I am so impressed with Athena and your beautiful library! Great job! Your are correct. Athena was really the driving force behind the organization of the library. All the kids love it though, and now they are more aware of how to “search” for a book. The kids are very proud of their library, which is the best gift. Wow! What a beautiful library! It looks like a wonderful room to get lost in. I love getting lost in a world filled with books, don’t you? Oh yes. I cannot think of many better ways to spend an afternoon. Thanks for reblogging. I am looking forward to visiting your blog. I was homeschooled! love the name of your blog and the library looks awesome! way to go athena! Thanks! It took us awhile to think of a name but then Homeschool Happymess just seemed right. As you know, things are pretty messy in a homeschool! Thanks for your encouragement. Athena was very personally dedicated to this project, for which we are very appreciative! Here is one more book you can add to your library. My second book was published in January of this year: “The First Time I Rode a Freight Train & other hitchhiking stories” (178 pages). Shiz this is superb! I always dream of having this! I love it so much! I love it like.. I can’t even compare. Ha-ha! You’re great! Thank you! We are really enjoying reading in the new library. I am sure your book collection will one day also become your personal library. This is exactly what I’d eventually like! I currently only have around 200 novels and a handful of reference books my ultimate goal is to compile a home library! Wonderful post! It sounds like you already have the beginning of a great collection. We got many of our books at library books sales and other second hand book stores. I am sure you will have a great home library too. It is a great way for family members to connect, through the sharing of favorite books. Great effort. That library is mighty impressive. Keep up the good work. Thank you. We really love books and are thrilled to finally have them in one place where they are easy to find and easy to share. Jealous! I would love to have this in my house aha. Thanks for reblogging. I look forward to reading about baked zucchini and mozzarella. Your library is amazing! I totally get you with the clue book game! My Kids and I are starting to organize our books as well!